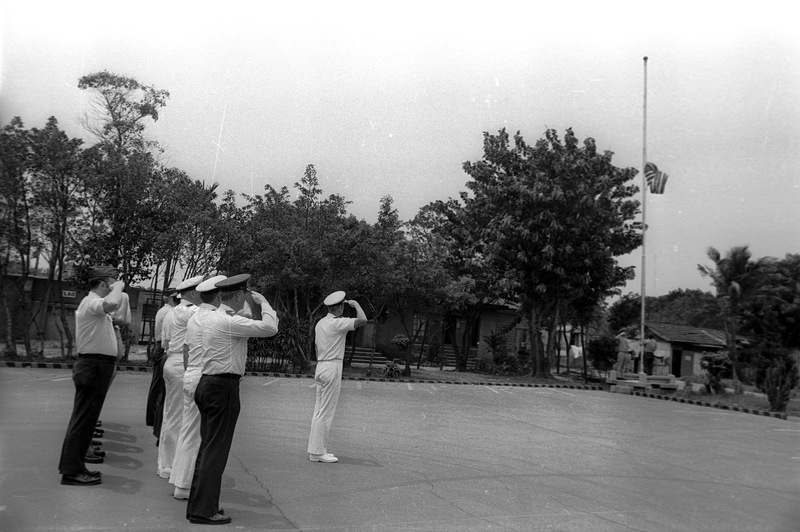 On April 28, 1979, the U.S. flag was lowered for the last time in front of the U.S. Taiwan Defense Command. Rear Admiral James Linder, USTDC Commander, presided over this ceremony, just as he'd already done at other U.S. military units in Taiwan. Marine SSG D. J. Gemmecke lowered the colors. Shortly after the ceremony, Admiral and Mrs. Linder departed the country. The building to the left of the flagpole was (as I recall) a Chinese military barracks. When we raised our flag each morning, two soldiers carried their flag from that building over to the ROC flagpole that was located to the right, directly across the parking lot from the pole in this photograph. When everyone was in place, one member of each team (the junior in rank) stepped up on his platform and hooked up his flag. The BMC (Chief Boatswain's Mate) stood next to the bell at the TDC main entrance. He had a radio tuned to a local station that played a series of beeps at precisely 8:00 AM. He'd then ring the bell eight times and both flags were quickly raised. The person who raised the flag would then step off the platform, stand beside his partner and join him in the salute. At that point, the BMC blew his whistle three times and both teams lowered their salutes and marched back to their respective buildings.